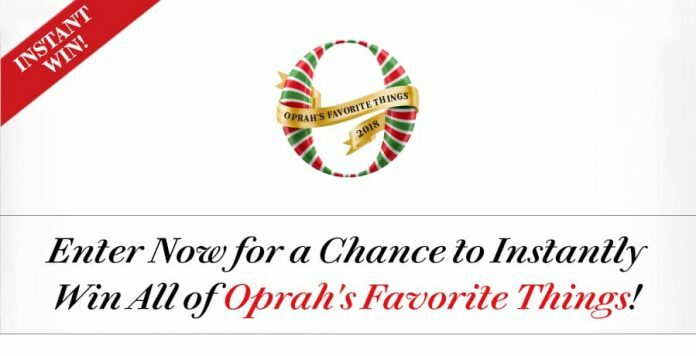 Oprah’s Favorite Things 2018 Instant Win Sweepstakes might be your best chance to win all of the Oprah’s Favorite Things 2018. That’s over $20,000 worth of products chosen by Oprah Winfrey herself. What is it? An highly popular Christmas Sweepstakes from Oprah Winfrey and O, The Oprah Magazine. When does it start? Starts at 12:01 AM (ET) on November 28, 2018. When does it end? Ends on December 9, 2018 at 11:59 PM (ET). Look for the Instant Win Sweepstakes code in the December 2018 issue of O, The Oprah Magazine, available via subscription beginning approximately 11/20/18 and at newsstands approximately 11/20/18 to 12/10/18. Beginning 12/10/18 at 12:01 AM (ET) through 12/14/18 at 11:59 PM (ET), go to oprah.com/instantwin18 on a computer or wireless device and complete and submit the entry form pursuant to the on-screen instructions, including the twelve-digit alphanumeric Official Code, which can be found on the “What I Know For Sure” page of the December 2018 issue of O, The Oprah Magazine. Send an email to instantwin18@hearst.com from a computer or wireless device and you will receive an automatic reply containing the Official Code; then follow the directions in subsection. Immediately upon entry, entrants will receive a pop-up window informing them of their non-winner status or that they will be receiving an email from a representative of O, The Oprah Magazine to verify their information and confirm whether that entrant is a winner. Oprah’s Favorite Things 2018 Instant Win Sweepstakes is open to legal residents of the 50 United States and the District of Columbia, who are 21 years or older at time of entry. Sweepstakes begins on November 28, 2018 at 12:01 AM (ET) and ends on December 9, 2018 at 11:59 PM (ET). Limit one (1) entry per person for Sweepstakes. Total ARV of each Prize Package: $21,657.40 per Winner. oprah 12 days will not let you enter your DOB the way you have it set up, say ” enter in mm/dd/yyyy. As retired elementary teacher, I enjoy the Oprah magazine. I would love to be a recipient of any of Oprah’s wonderful treasures. I put in 075 which is the code in the magazine for today 12/2/2018. They say it is not the code. What’s up? I can’t enter.